Under the able guidance of our Resident Acharya Swami Abhedananda, we are proud to share that Chinmaya Mission South Africa has expanded not only in Durban city but outside as well. On 22 April 2015 the newest chapter was launched with the opening of the Johannesburg ashram. With divine grace and sustained efforts of devotees in Jo’burg, a beautiful new property for the Johannesburg ashram has been acquired at 50 Rosies Place, Glen Austin, Midrand. 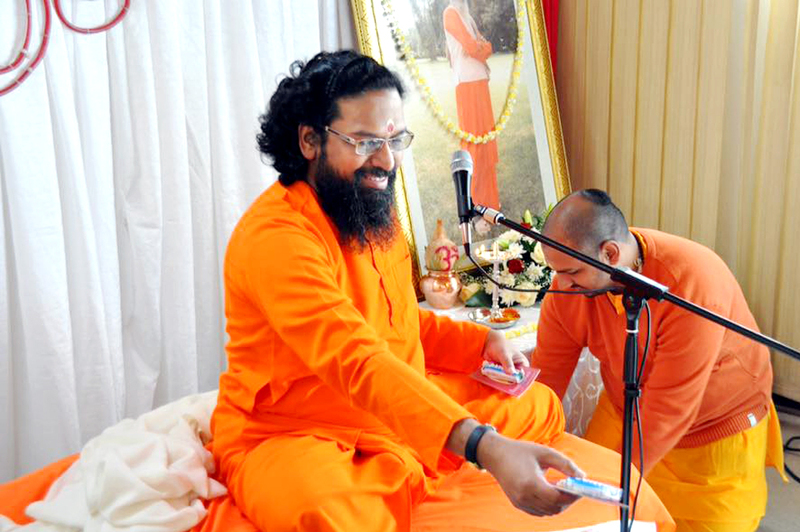 To invoke the blessings of the Lord, bhoomi puja was performed in the presence of Swami Abhedananda and Br. Abhijit Chaitanya. This marked an important day in the journey of Chinmaya Mission South Africa, as we reach out to a wider audience, in our quest to love and serve more and more people, spreading the bliss of our scriptures expounded by Pujya Gurudev Swami Chinmayananda. 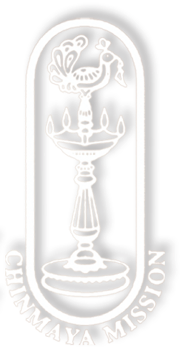 The Chinmaya Mission centre of Johannesburg has been organising a grand Mahashivratri celebration at Gallagher Convention centre every year. Started in 2007 with the blessings of Swami Abhedananda, the celebrations have been a huge success, with each year attracting thousands of devotees to celebrate the auspicious marriage of Lord Shiva and Mother Parvati. The celebrations start from around 6 PM in the evening and go on till early hours the next morning. The Puja is conducted all through the night with abhishek and chanting of rudram and chamkam. This is followed by shiva sahasranaam archana where 1008 names of Lord Shiva are recited by devotees with continuous offering of milk, flowers and bilvapatra to the Lingam throughout the night. The grand scale of the event has attracted huge attention from the media, and has been covered by national radio station Lotus FM and Zee TV. The Mahashivratri event also features a devotional talk by Swami Abhedananda, where he mesmerizes the seekers with insights in conjunction with Shivaratri on various topics from Ramcharitmanas. The enlightening discourse enthrals the audience when Swamiji dexterously applies Lord Shiva’s stories to living a happy, successful and fulfilling life. 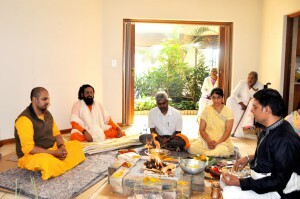 ON the Shivaratri night, Swamiji also conducts ‘Question and Answer’ session which has been very popular. Devotees listen intensely as Swamiji clears their doubts and misconceptions spontaneously with accuracy and wisdom, sprinkled with abundance of humour. These Q & A sessions are broadcasted all over South Africa. The celebrations also include melodious devotional songs by various artists singing the glories of Lord Shiva. Chinmaya Mission Johannesburg’s dedicated and enthusiastic team tirelessly put efforts to make this event a success every year. Swamiji being the real magic with his unparallel love for Lord Shiva and his inspiring discourses keep on attracting more devotees to be part of this auspicious celebration. The Mission centre has been blessed by the satsangs of our worldwide head, Pujya Swami Tejomayananda, whenever he has visited the country. In the last decade, many Yagnas of Swami Abhedananda have been enthusiastically organised by the Johannesburg Mission at the beautiful venue of Natural Getaways at Glen Austin, Midrand. Swamiji has expounded beautifully on various topics from the sacred text of Shri Ramcharitmanas. Gayatri Havan : 10:30 – First Sunday of every month. 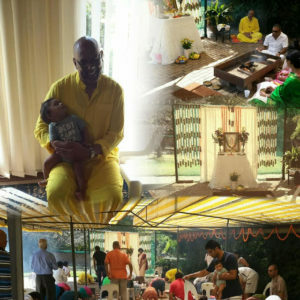 Monthly camps by Swami Abhedananda – Half day camps are conducted by Pujya Swami Abhedananda at Johannesburg centre once every month. Devotees get the wonderful opportunity of asking questions to Swamiji in the most awaited Q & A session, which is then followed by lunch bhiksha for all. 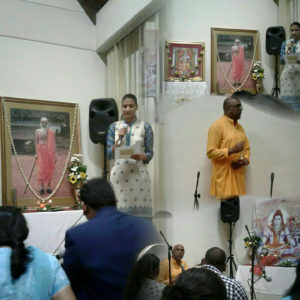 With the ongoing activities, and the newly established ashram, Chinmaya Mission Johannesburg has taken a major leap towards steering the next phase of growth for the Mission’s expansion in South Africa. Please join us to be a part of this wonderful phase, and soak yourself in the divine bliss of knowledge, devotion and service!